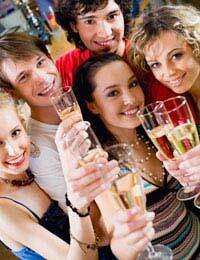 Organising a surprise birthday party, be it for a relative or friend, can be a stressful and time consuming affair. And of course, there's always the danger that after all your hard work, the recipient is going to flounce out or be totally annoyed at quite unexpectedly being the centre of attention! Choosing to host a surprise birthday party should not be undertaken lightly! Make sure you are entirely certain that your guest of honour will enjoy the event and will take it in the spirit it was intended – if there is any doubt in your mind that the party will not be gratefully received, then don't do it! Your first stumbling block is undoubtedly going to be organising the event without the recipient becoming any the wiser. Getting your venue sorted should be your number one priority – and make sure you have any confirmation and correspondence sent to an address or email account that the birthday boy or girl will not have access too – the last thing you want is to be rumble even before the invitations have been sent out! And if you don't get rumbled, then invites should be the second item on your to do list! Again, make sure that your guests can reply to an alternative address or email account – and make it quite clear on the invitation that it is a surprise party and should not, under any circumstances, be discussed with the guest of honour! If you decide to go with a theme for your party – and think about this carefully, given the amount of stress you are already going to be under! The best advice is to keep it simple. The last thing you want to have to contend with when you are trying to keep the whole things secret is five foot tall wall decals, a hundred helium balloons and piles and piles of tablecloths and napkins being delivered....or indeed finding somewhere secret to store them! In the run up to the party enlist as much help as you can to keep the pressure off – you will be busy enough without having to constantly watch your back to make sure you are not being eavesdropped on, followed or found out! You could even assign someone the job of keeping the guest of honour entertained so that they do not suspect anything – if they can be completely taken out of the equation for the duration, so much the better! Make sure everything is ready in good time at the venue so you can slip away a couple of hours before the party and prepare yourself for the celebrations – after all your hard work it is as much your evening as the intended recipients! Ensure too that concrete plans are in place for the arrival or others guests ahead of the guest of honour, and that everyone is briefed and in their place before he or she arrives! Then once that initial “Surprise!” moment is over and all the stresses have gone, kick back and enjoy the night!